This Asian green is prized for its mild flavor in salads and stir fries, heat- and cold-tolerance, and fine leaves that form an attractive rosette. Though not as demanding as many cole crops, prefers well-drained, fertile soil high in organic matter, pH 6.0 to 7.5. Can tolerate slightly alkaline soil. Has contrasting white petioles and veins. Deeply cut, fern-like leaves form an attractive rosette. From early spring to late summer, sow seeds � to � inch deep, 1 inch apart in rows 18 inches apart. Thin to 6-inch spacings. Plant every 2 weeks for continuous harvest. Use floating row covers to help protect from early insect infestations. 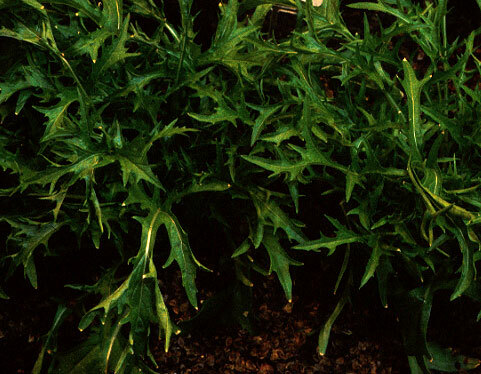 To help reduce disease, do not plant mizuna or other cole crops in the same location more than once every three or four years. Mizuna generally suffers less insect damage than other cole crops. Use floating row covers to prevent early season infestations. Not as susceptible to diseases that often plague other cole crops. 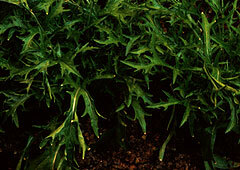 Browse mizuna varieties at our Vegetable Varieties for Gardeners website.